A Knoxville police officer shot Wednesday night while trying to arrest a Florida career criminal at an East Knoxville motel has been released from a hospital and the suspect faces a charge of attempted first-degree murder. Officer Jimmy Wilson, who joined the Knoxville Police Department in 2006, was released shortly before 11 p.m. from the University of Tennessee Medical Center, police said. 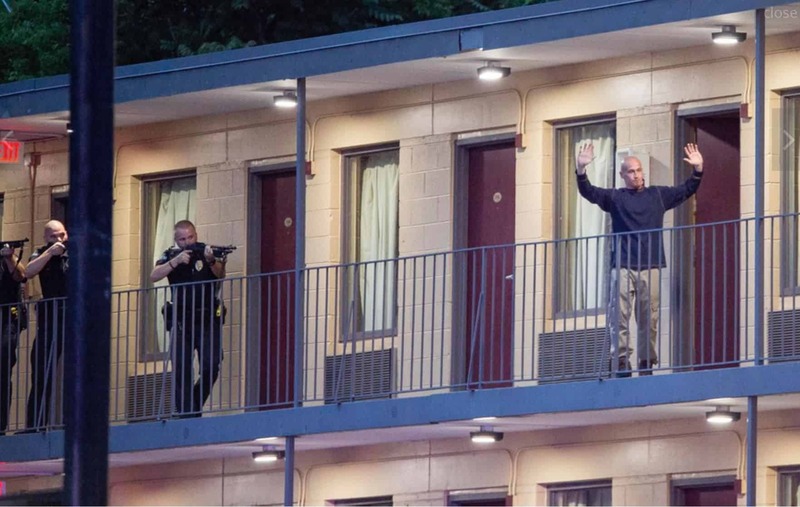 Wilson’s bullet-resistant vest shielded him from the single round fired when the door suddenly opened about 8:14 p.m. at a room in the Best Value Inn, 3207 E. Magnolia Ave.
Matthew Pryor, 30, surrendered at 8:46 p.m. without further violence, police said. Authorities charged Pryor with attempted first-degree murder, possession of a firearm during the commission of a felony and being a fugitive from justice, according to jail records. Pryor “stated that he opened the door with the handgun in his possession with the intent to shoot the victim,” court records state. Pryor is accused of engaging in a running gunbattle with a warrants detective with the Miami-Dade Police Department the day before his encounter with Wilson. Miami-Dade police spokesman Detective Daniel Ferrin said four detectives from the warrants bureau went at 7:30 a.m. Tuesday to Pryor’s mother’s house to arrest him. Pryor, who Ferrin said had been designated as a career criminal, was wanted on two probation violation offenses. Ferrin said Pryor was on probation on convictions of burglary and theft. “When they knocked on the door, he fled and there as an exchange of gunfire,” Ferrin said Thursday. Ferrin said he was unsure of the type of handgun Pryor had or how he escaped from his mother’s house. The exchange of gunfire occurred outside the house. Ferrin said one detective “was shot at by the subject” during Pryor’s escape. The detective was not struck and Ferrin said there was no indication Pryor had been wounded. When Pryor was less than two blocks from his mother’s house, he encountered a woman driving a silver, 2011 Nissan Rogue. Pryor at gunpoint forced the woman from the vehicle and left the area, Ferrin said. Ferrin said authorities have filed charges on Pryor of attempted murder, aggravated assault on a law enforcement officer, possession of a firearm by a convicted felon, possession of a firearm in the commission of a felony and armed carjacking. Knoxville police said Pryor arrived Wednesday afternoon in Knoxville and rented a room at the Best Value Inn for the night. Ferrin said police were unaware of any connection Pryor might have to Tennessee through family or friends. Wilson identified the stolen Rogue in the parking lot of the motel at 8:04 p.m. Wednesday and requested help from other officers, police said. With the aid of two officers, Wilson launched a search for Pryor. Officers identified themselves as the police as they knocked on the door at Room 316. Police have not disclosed the caliber of weapon Pryor allegedly used to shoot Wilson. None of three officers returned fire, police spokesman Darrell DeBusk said. Officers got Wilson to safety and called for the Police Department’s Special Operations Squad. Daniel Pendleton of Knoxville was in the room next door with his girlfriend when he heard the gunfire. “About five minutes later the police knock on the door and tell me I need to get out of the hotel, that a man had shot through the door at the police,” he said.